Castile simply means 100% olive oil and this is where less is more. Originally from Spain, the soap is reputated to be soft, slightly slimy. The benefits of this soap outweighs the labour that goes into making it. The soap is so gentle, I would recommend it for face and babies. It is so mild when I use it on my face I find that it doesn't have that taut feeling. If it does, then it would probably be because I haven't fully rinsed off the soap. 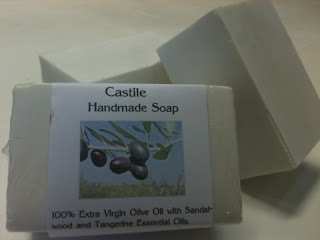 The soap just doesnt strip off your natural oil, I love it so much I want to make an entire range of just pure Castile soap. It is lightly scented but if you really want to get a good lather out of it, it is best done mechanically with a pouf or face towel. Remember to drain the soap and the soap will last you a lot longer. Like with all my soap I try it on my face, hair, body but when you do it right the lather comes off creamy and dense. I am waiting patiently for my hubby to have his next shave, I think it will make a nice shaving cream. These are bigger bars around 150gms to 165gms, and they cost $15 a bar. Ingredients: Extra Virgin Olive Oil, purified water, salt, sodium hydroxide with tangerine and sandalwood essential oil.